Good news to all momcenter members, Children’s Dental Center will give FREE comprehensive Dental Assessment and Oral Prophylaxis for all your children ages 6 months to 18 years old. 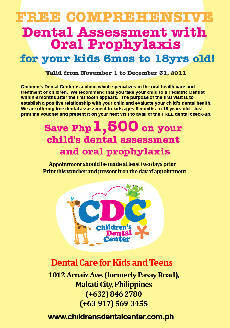 You will save a total of P1,500.00 on your child’s dental assessment and oral prophylaxis. Maybe I am one of the first who take advantage of this give away since I haven’t brought Ren to a pediatric dentist since he was born, and I am so glad that his first visit will be at the Children’s Dental Center and it’s for FREE. I already made an appointment, and will tell you about our experience after we avail of this exciting promo, so stay tuned. a visit to Mams Kiddie Funland at Starmall Alabang and FREE tickets give-away! FREE Cake Roll Slice at Goldilocks! FREE Delifrance new Chicken Bourbon Sandwich! Mukhang ok to…sana meron pa nito when we are in Manila.